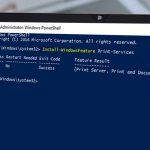 This time we will take a closer look on how to migrate print server with the Print and Document Services role installed from Windows Server 2012 R2 to Windows Server 2016 Core. In our scenario, LPR (Line Printer Remote), IPP (Internet Printing Protocol) and WSD (Web Services on Devices) protocols are not used. 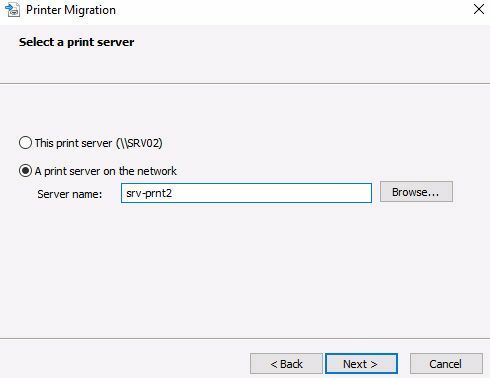 How to Migrate Print Server from Windows Server 2012 R2 to Windows Server 2016 Core? 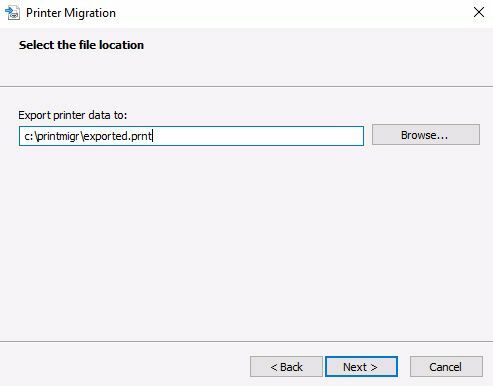 The print server migration process is performed using the Printer Migration Wizard tool. 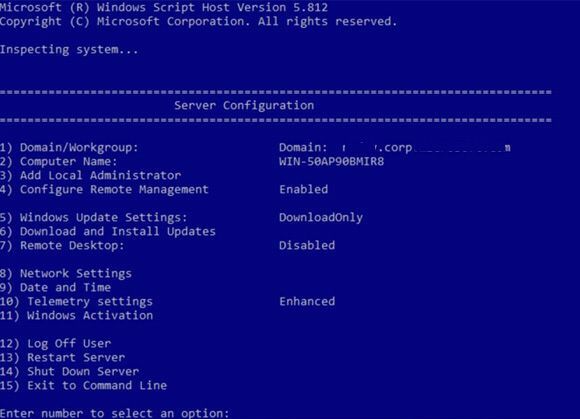 You can run it through the MMC Print Management snap-in or using the Printbrm.exe command line utility. You can run the migration wizard either on the source server itself (if it is installed with a GUI), or on any other computer with the Print Management snap-in. 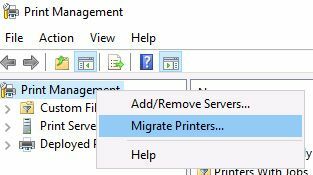 On the Server Core, the Printbrm.exe migration wizard is not available. 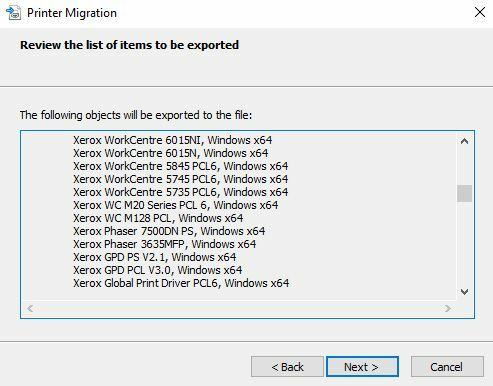 The Migration Wizard tool allows you to export all the drivers, printer settings, print queues to the export file that can be imported to the target server. The final step is to decommission the source server and assign the target server the same name and IP address of the original server. This way all clients will continue printing without changing its settings. If it is not possible to assign the same name and IP address to the target server, then after the migration finish, it is necessary to reconfigure all clients (manually or using GPO) to use a new print server. Additional. If the target server must support LPR, IPP or WSD, then you must install and configure the appropriate components. Before migrating, it is advisable to update the drivers on the source server to the Package-Aware versions (Package-aware printers have entries in their INF files that support point and print with packages). Important. You should use the latest version of the migration wizard during the migration process. 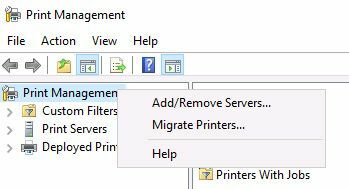 In this example, we use the migration wizard from the Print Management console (printmanagement.msc) on Windows 10. The Print$ share must be available on both servers. 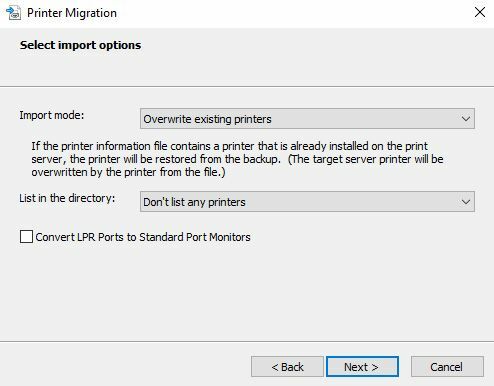 Start Print Management console, right click on Print Management and select Migrate Printers. 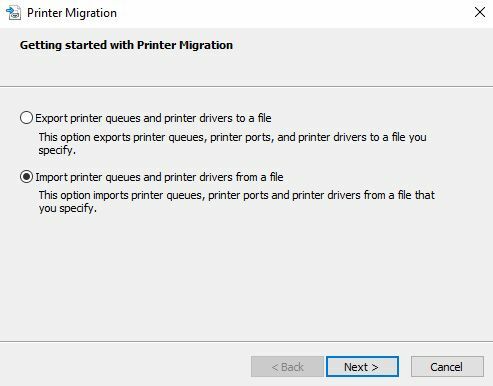 Select option Export printer queues and drivers to a file. Enter the name of a new print server. Review the list of objects to export. Wait until the export is complete. The size of the export file can be quite large. In our case, 80 printers and about 60 drivers were installed on the print server. The file size was about 1.4 GB. Before you start importing printers, you need to create at least one printer. Otherwise, the print$ shared folder on the new server will not be created and the migration process will be interrupted with the error Event ID 71 from PrintBRM. Start the Migration Wizard again. 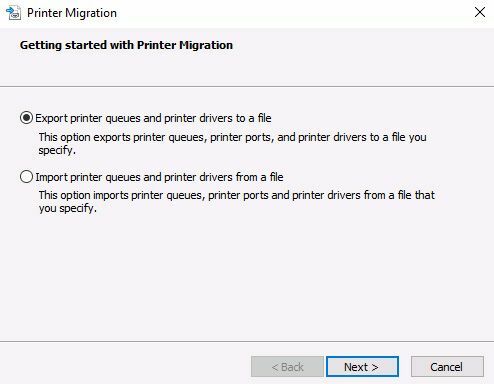 Choose option Import printer queues and printer drivers from a file. Specify the server name and path to the data file. Since in this case printers are already published in Active Directory, we will not re-publish them to avoid making duplicates. After the import is completed, the wizard will prompt you to investigate the errors that have occurred during the import process. You can install problematic printers on the destination server manually. After configuring all the printers on the target server, you can rename the source and target servers. But before you rename the source server, you need to delete the printer’s publications in Active Directory. In Print Management console select all printers, right click and select Remove from Directory. This was the last step to migrate print server. Hope this was useful!